This image is used to build an analogy for beating procrastination, in which one must forgo guilty leasure in the “Dark Playground” by entering the “Dark Woods”, a path representing work and accomplishment. If one can make it all the way through the dark woods and complete the task without being enticed back into the leisure of the dark playground, one reaches the “Happy Playground”, a place of well-earned, satisfying leisure. You occasionally even end up super-engaged with what you’re working on and enter a state of Flow, where you’re so blissfully immersed in the task that you lose track of time. Flow is a fantastic thing: hugely productive and fulfilling. 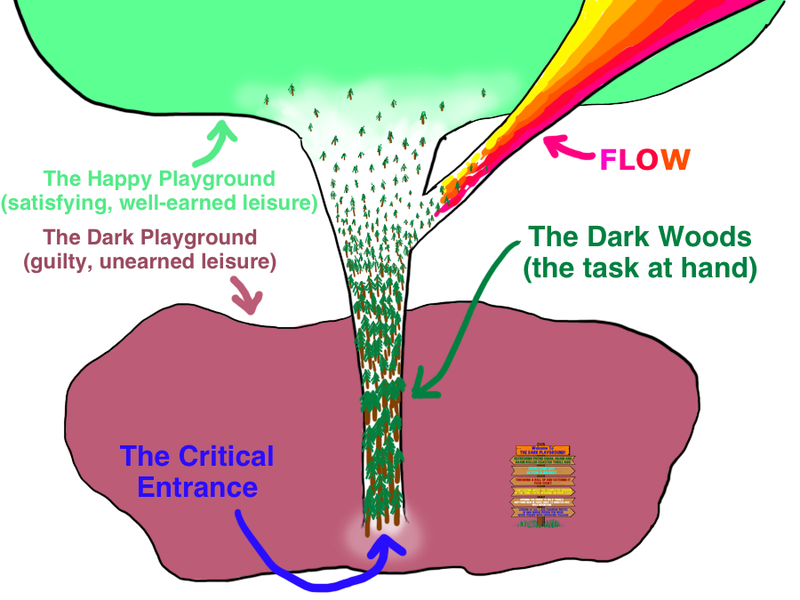 Just as the Dark Woods are surrounded by the Dark Playground, meaning that one is constantly enticed by the ability to quit the task at hand and return to procrastination, the Flow path is surrounded by the Happy Playground; it is possible to break out of flow at any point and enjoy your accomplishments. However, I found it telling that the end of the Flow path wasn’t pictured. I’ve found that just as the Dark Woods can escape from the Dark Playground, the Flow path can “escape” from the Happy Playground. At that point it no longer feels like an option to just quit and relax. You’re *accomplishing* things! Leisure time would just be a *waste*. The Flow path also continues to spread out, becoming less focused, less productive. Eventually, you end up at a point where you’re no longer in Flow, you’re just *Floating* (or “Flowting”, if you like). I see Floating as the flip-side of the procrastination coin. When you procrastinate, you know you should be working, but your instincts betray you and cause you to seek out unfulfilling entertainment instead. When you’re Floating, you know you’re no longer being productive and you should take a break, but now your instincts are telling you that you can’t waste time; you have to keep pushing, keep working. I wouldn’t be surprised if there’s a correlation between susceptibility to procrastination and Floating. One of the aggravating factors of the Floating state is the knowledge that a period of beneficial rest could ultimately lead to procrastination. Given their similarities, perhaps the remedies are similar as well. Perhaps the solution to Floating is structured recreation. I’m not sure. I do know it’s a real issue though. Perhaps now that I have something to call it, it will become easier to recognize and combat. Have you ever discovered a cool webcomic, blog, youtube channel, etc., and wanted to read it from the beginning? Noticed that there isn’t really a good way to do that? RSS feeds are great for keeping up to date with something, but (as far as I know), there’s no way to ‘go back to the beginning’, unless the site is specifically designed to allow it. Of course, you can just read a few then bookmark where you left off in your browser (or ‘favorite’ it if you’re using IE), but then every time you read a few more, you have to manually update the bookmark. I was thinking, wouldn’t it be cool if there was a way – a Firefox extension maybe – to create dynamic bookmarks, which automatically updates to the last page you were on? So you’d open up the bookmark, read a few comics, blog posts, etc., and it would automatically be updated to the last page you viewed before you moved on to another site or closed the browser tab. Next time you open that bookmark, you could just pick up where you left off. If you know of something like this that already exists, please let me know about it in the comments! And if you have experience with browser extensions and would like to create it, I would be happy to promote it on the links page at SearchTempest.com! While I’m on the topic, here’s a great TED talk I saw today. Theoretically it’s about entrepreneurship, but it touches on all kinds of interesting concepts. If nothing else, skip to the last couple minutes and listen to his question at the end. But don’t do that, because the whole talk is great. 😉 If you’re not familiar with TED talks (or if you are and love them as much as I do), here are some more I’ve enjoyed: Dan Gilbert – Why are we happy? and Mistaken expectations Paul Collier on the “bottom billion” Benjamin Zander on music and passion And about a million more. Feel free to share your favorites in the comments! Now that I’ve moved from my old life to working on Tempest full time, I finally get to set my own hours. I always figured that would be great. No more dragging myself out of bed too early in the morning. No staring bleary-eyed at the clock, watching the second hand drag along until it’s finally 5:30. Work when I want. Sleep when I want. And do whatever I want the rest of the time! Great, right? And it IS. But not like I expected. Getting up when you’re rested is awesome, except that I’m someone who could sleep 10 hours a night if I let myself. And without a boss expecting you to show up at a reasonable hour, it’s surprisingly (or unsurprisingly) easy to do exactly that. Before, I had to get up for work. Now, I have to get up, because… I have some vague understanding that if I don’t, over time, I’ll feel bleh. It’s a bit harder to wrap your head around that when the alarm goes off in the morning. (Fortunately my wife rather likes me to be around during the daylight hours too, so that helps. 🙂 ) So the ‘worst’ part about setting my own hours is that I get to sleep in. The best part? I can work really long hours! That’s right. The best part is if it’s 1am and I’m getting some really great work done, I don’t have to quit because I’m expected to be ‘at work’ the next morning. Or when 5:30 rolls around, I don’t feel compelled to pack it in, since I’ll have to be back at the same time regardless. If things are going well, I can grab a bite then get back to it. When I’ve finally gotten the entirety of a complex problem shoehorned into my brain, or when I’m on a creative roll and the ideas are coming one after another, I don’t have to stop. And that is great. I honestly think there are days now where I do the equivalent of a week’s work in my old 9-5 jobs. When I’ve finally gotten the entirety of a complex problem shoehorned into my brain, or when I’m on a creative roll and the ideas are coming one after another, I don’t have to stop. And that is great. I honestly think there are days now where I do the equivalent of a week’s work in my old 9-5 jobs. Of course, you can’t do that forever. And the other benefit is that you don’t have to. I spend periods of days or even weeks working what feels like every waking minute, but follow them with periods of similar length where the extent of my work is replying to emails. I recharge, have fun, and then, start having ideas. Eventually, I can’t wait to get back to work and let that creative energy flow into making something cool. If you’re lucky enough to set your own hours and would like to try something that might boost your productivity and enjoyment of your work, Steve Pavlina suggests one way to get started. That schedule ironically ended up being too rigid for me, but it’s at least a good primer. Paul Graham’s essay on Good vs Bad Procrastination also has some great insights. In fact, while you’re there, check out some of his other stuff. It’s all fantastic. And if you’re an employer, think about the benefits of giving real flex hours to your employees. Not “show up any time between 8 and 9”. More like “as long as you’re here for scheduled meetings, come in most days, and get the work done, do whatever works for you.” Because really, is it more important to make certain everyone’s working exactly 8 hours a day, 40 hours a week, or would you rather have happy employees producing higher-quality results, faster? Obviously there are challenges to work around, but it’s worth it. I’ll write more about that side of things in a later post.